Let's get away from the newest creations or what the animals have done recently and talk a bit about sustainability and "Getting Back to Basics". As some of you may know I have been teaching a class called "Back to Basics" for the past few years at the Nature Center where I work. In these hard times and a society based on wasteful living I think it's important for us to look at ways to get back to that. I remember going to my husband Grandmothers house for dinner and she even recycled her paper towels! Used them and hung them up to dry. Her generation was raised on frugal ways and stretching all she could out of everything. In this picture to the left is my idea for fire starters for the fireplace or the woodburning stove. I take old candles in their jars, melt them down in a double boiler (in water, never on direct heat) and pour them into old paper egg cartons. As you can see I used it last night by ripping off one of the egg holders filled with wax and used it to light the wood burning stove last night. You can also use some lint from the dryer to help it ignite. Place some in the bottom before filling with wax. So do just one thing every day to get back to basics! 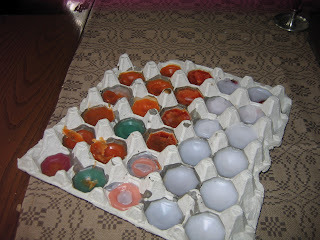 I used to make fire starters years ago with shaved candles and sawdust. Made them in cupcake papers. I even had an old newspaper roller too which could sometimes roll the paper too tight. I use old fashioned 'rags' to wipe spills and throw them on the wash to reuse. My mop is an old fashioned mop with a green scrubber pinched in the clamp for those tuff spots. I save cans for baking in too. Not white or gold ones though.